All is not well amongst young Athenians. Hermes and Lysander are in love but Hermia’s father objects to their proposed marriage, favoring Demetrius instead. Demetrius is infatuated with Hermia, rejecting the woman he once loved (and who still loves him) Helena. Hermia and Helena are good friends. Hermes and Lysander flee Athens into a nearby woods and are followed by Helena and Demetrius. The woods are occupied by fairies who are going throrugh their own domestic disquiet. Oberon, the king of the fairies and Titania, his wife, are having a tiff over who should raise an orphaned human baby. So Shakespeare creates a complicated set of relationships that interact in unexpected ways with each other. The current production at the Folger Library , directed by Aaron Posner, emphasizes the comical aspects of the play. As played, the characters are amusing but mostly cardboard figures. The notable exception is Oberon (Eric Hissom) who is an intriguing combination of willfulness, anarchy, and benevolence. His chief assistant, the mischievous Puck (Erin Weaver) is changed to a female in this production and her body language indicates she is taken with Oberon who is oblivious to this. The clowns who perform a play in honour of the wedding the Theseus, King of Athens (also played by Mr. Hissom) and Amazon queen Hippolyta (Caroline Stefanie Clay) are also changed from men a to women in this production, but to no evident purpose. In fact it makes their evident concern not to shock “the ladies” in the audience difficult to believe in. The play ends happily with everyone married off appropriately and the fairies make a final appearance bringing magic and blessings to all three couples. But the song and dance engaged in by the entire cast (not just by the fairies as called for in the script) is pretty noisy and does not convey (at least to me) a final mood of magical, joyful benevolence. 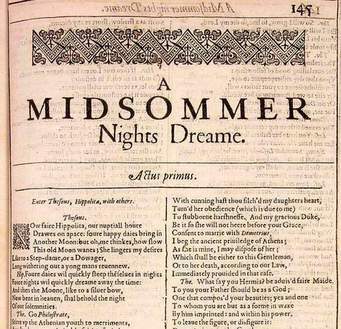 “A Midsummer Night’s Dream” is being performed at the Folger Library in Washington, DC through March 6, 2016.